Does a little splash of Cabernet Sauvignon, Syrah or Merlot ruin Chianti Classico? It would be an interesting question to pose to Giovanni Poggiali, who helms the respected Chianti Classico estate of Fèlsina. I haven’t had the opportunity to meet him yet, but I’d love to hear his thoughts. That’s because his estate embraces the backbone grape, Sangiovese, to the fullest extent. Fèlsina’s Chianti Classico wines are entirely comprised of this cherry-rich, leathery, tannic red grape that — to so many people — is the quintessential taste of Tuscany. But Fèlsina is not alone. 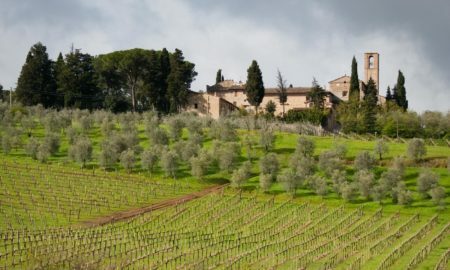 As I studied the 2009 Fèlsina “Rancia” Chianti Classico Riserva a few weeks ago, I began to review all of the Chianti Classico tasting notes I had stored on my phone. A trend emerged: my highest-rated wines — Fontodi’s Chianti Classico, Castello di Volpaia’s “Il Puro,” Fattorie Melini’s “Selvanella” Chianti Classico Riserva, and now, Fèlsina’s “Rancia” — were all 100% Sangiovese. So I began to wonder: is varietal character the hallmark of excellent Chianti Classico? And if so, was finding a pure Sangiovese wine the key to buying the best Chianti Classico? 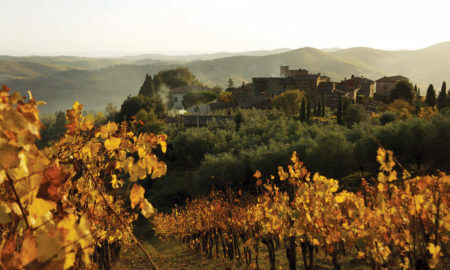 According to tradition, Chianti Classico has never been a varietal wine. It’s history is as a blend. Currently, the Chianti Classico DOCG’s disciplinare di produzione states that a minimum of 80% of the wine needs to be Sangiovese, while up to 20% of the wine can be comprised of specific grapes with set percentages. These include Canaiolo Nero, Mammolo and three international celebrities: Cabernet Sauvignon, Syrah or Merlot, which are often used to add fruity tones to Sangiovese’s stoic, rigid character. White grapes are now prohibited. 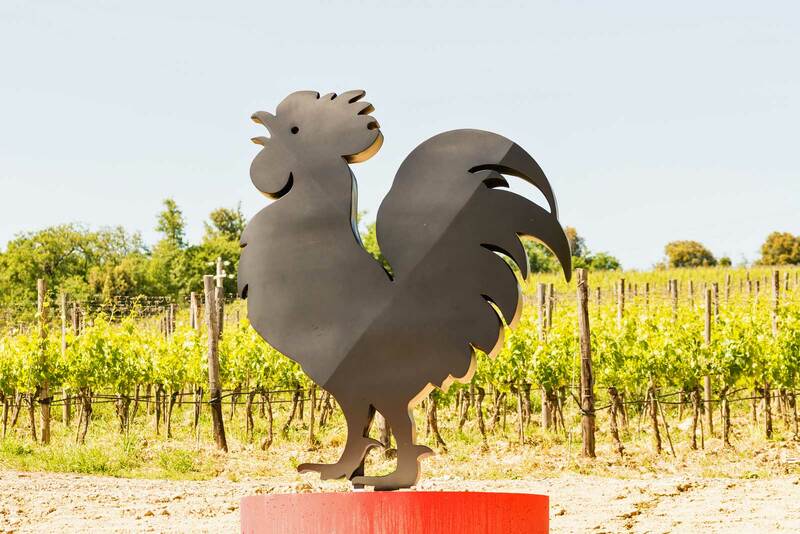 The Black Rooster is the symbol of Chianti Classico. But Chianti Classico’s history with this blend is a bit of a jumble. In the 1850s, the formula was codified to include large portions of Malvasia, a white grape that yields aplenty but oxidizes easily. The formula wasn’t just a guideline: it became law well into the 20th century, and even dictated the percentages of plantings across the region, essentially casting the blend into stone for generations. By the 1960s (coincidentally, when Fèlsina came into existence), the wine known as Chianti Classico was completely different from today’s wine, as it allowed Trebbiano and Malvasia to account for up to 30% of the blend. But as growers began to better understand how to get the most from Sangiovese, these white grapes not only became superfluous, they became a hinderance. Things came to a head in the 1970s and ’80s. An influx of wealth and a growing international wine trade put pressure on tradition. 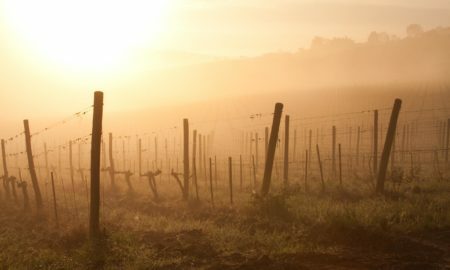 Winemakers and estate owners increasingly felt that the outdated regulations held their wines back, but the Consortium would not budge on amending the rules. So many estates exerted their influence by modifying the blend as they saw fit, and abandoning the Chianti Classico name altogether. Thus, a class of wines informally called “Super Tuscans” was born. 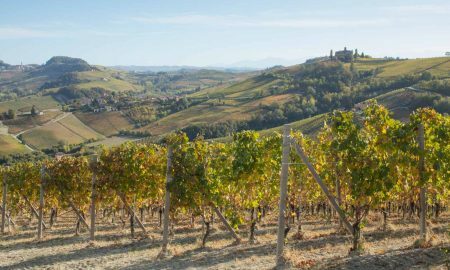 They became a huge hit, and the Consortium was faced with a difficult reckoning: abandon the traditional formula or stay put and watch the region’s top estates (and the international marketplace) abandon Chianti Classico. In 1984, they compromised by revising the regulations … to a degree. They reduced the role of the white grapes (they were still required for a time, albeit in small proportions), they increased the prominence of Sangiovese to a minimum of 80%, and they allowed for up to 20% of the blend to be comprised of Cabernet Sauvignon, Syrah and/or Merlot, as well as a selection of native red grapes. But it wasn’t until 1995 that the Consortium finally came around to allowing 100% Sangiovese wines within the Chianti Classico DOCG. If that makes your head spin, then that’s exactly my point: what is the true identity of Chianti Classico wine? As a wine buyer, I’ve wrestled with this for years. How do you know what you are going to get with a Chianti Classico you’ve never tried? When Chianti Classico is at its best, Italian wine is at its best. But sometimes, these wines are forcefully dry and gruff; other times, they’re shrouded in anonymity. Could the variability of the blend be responsible for the variability in quality? I find it easier to put my faith in the disciplinare di produzione of Barolo, Barbaresco and even Brunello di Montalcino, than I can in Chianti Classico. Perhaps part of the reason why is because they are all varietal wines. That’s not to say blended wines in Italy are inferior, but perhaps varietal wines are better served by an appellation system that is intended to preserve two things: tradition and reputation. But if that reputation — in the form of a blend recipe — is a sliding scale, what good are the regulations? Chianti Classico: ’tis gorgeous, no? Could it be that those who produce a varietal Sangiovese wine do so because of confidence in their vineyard selection? 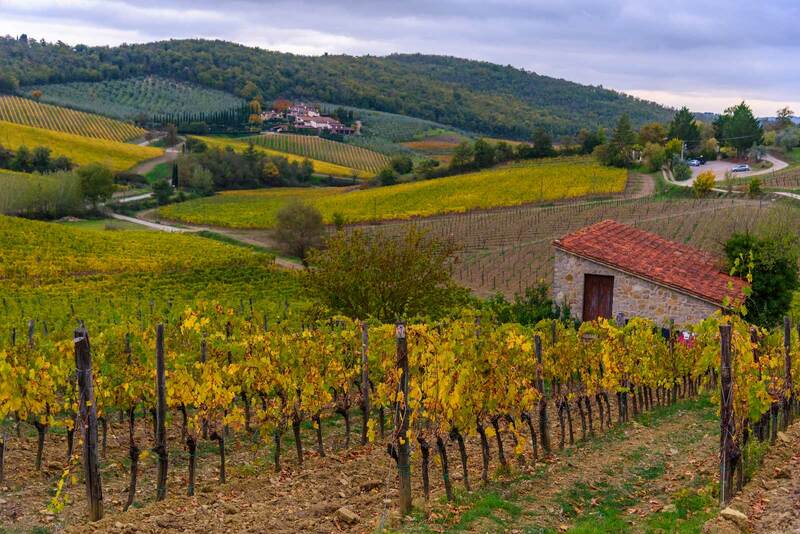 Which brings me back to Fèlsina, and their steadfast determination to produce Chianti Classico of a varietal nature. A while ago I sampled their entry-level wine called “Berardenga,” which struck me as conservative, classic yet surprisingly juicy. It had a wild note of hay that I hadn’t come across before, but beyond that, it was traditional and comforting. Bought at the same time, Fèlsina’s Chianti Classico Riserva called “Rancia,” turned out to be a whole other matter. It was from the 2009 vintage, which some critics had discouraged from cellaring, simply because the vintages that surrounded it were so outstanding. But eight years was enough of a wait for me. We served it on a weeknight shortly after Christmas, and the wine showed a beautiful balance between mellow tannins and fresh, vibrant acidity. Sangiovese often has a distinctive note of leather. Sometimes, its firm and a little gruff. Other times, it’s subtle. But never before had I encountered it like it was in Fèlsina’s bottling. It was somewhat sweet, and certainly soft — more like a lambskin leather coat than a horse saddle. The tannins were particularly pleasant, adding a little grippy traction to the wine’s body, and helping it accentuate the bison burgers we enjoyed with it. Most importantly, the oak was managed properly. “Rancia” additionally benefits from 50-year-old vines which serve up smaller yields with more defined character. They are also farmed organically. It is the most overused adage in winemaking, but it is true: it all starts in the vineyard. Given Chianti Classico’s history as a blend, it would be silly to suggest that they revise the regulations to make it only a varietal Sangiovese wine. But if you have excellent Sangiovese to begin with, what do you need any other grape for? Tasting notes: Aromatically powerful: potent and precise waves of blue and red fruit aromas, followed by more precise scents that recalled cherry, cedar, vanilla bean and leather at various times. It was this last note that was most defining. Chianti Classico often carries leathery tones, but here it was noticeably softer and more supple. Supremely elegant, mild tannins that must have softened with the eight years of age, and a freshness in the acidity that encouraged more sipping. A fine example of aged Sangiovese. Serving suggestion: Acquired two years ago and cellared at 58º F since then, we opened and decanted this wine a good 30 minutes before having the first glass. It was paired with bison burgers and roast potatoes, and I’ll be damned if there is a better pairing. Note: If you find this post controversial, please leave comments below to chime in with your own experience.